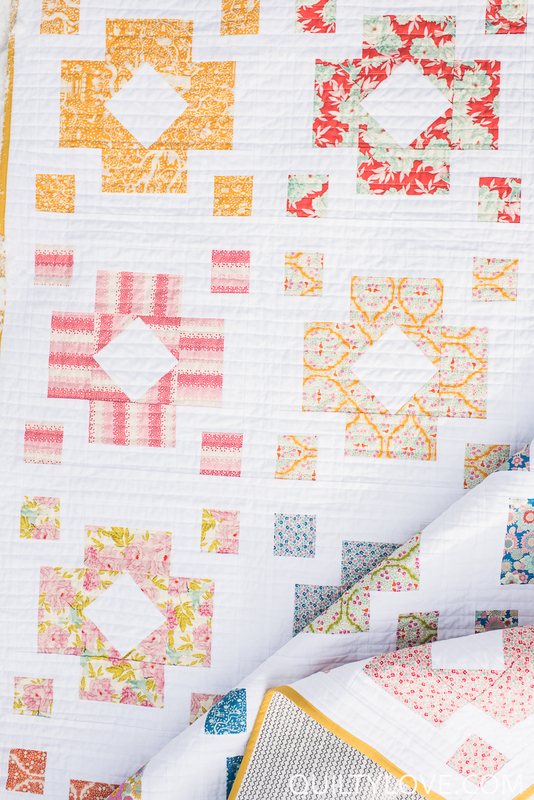 I’m excited to share this brand new quilt today. 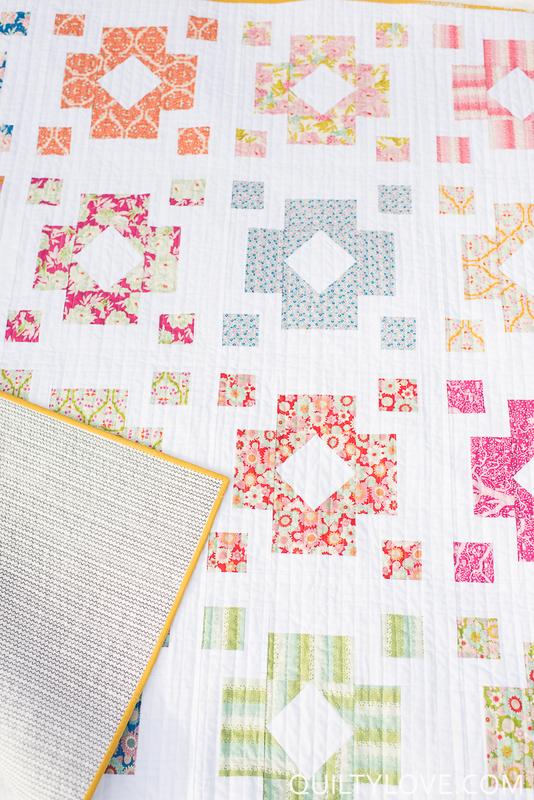 The Diamond Lanterns quilt pattern has been in the works for a while now and is now in the Quilty Love shop. I sketched this quilt pattern up one Sunday morning. It’s the rare occasion that started on paper and then made it’s way into Illustrator. 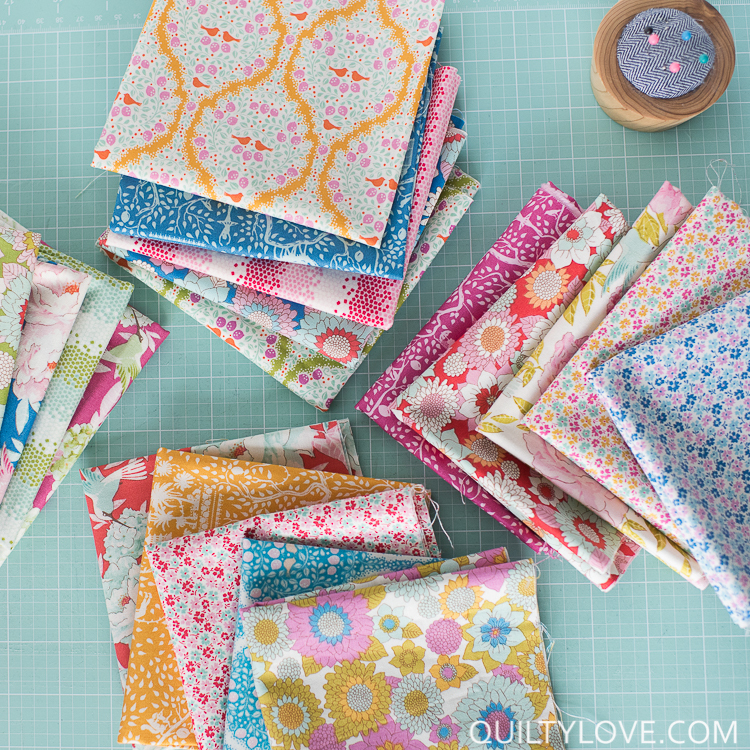 Tilda fabrics reached out a while ago and sent a bundle of their brand new Lemontree fabric line. It’s such a beautiful Norwegian inspired line of fabrics. Diamond Lanterns was inspired from this fabric. 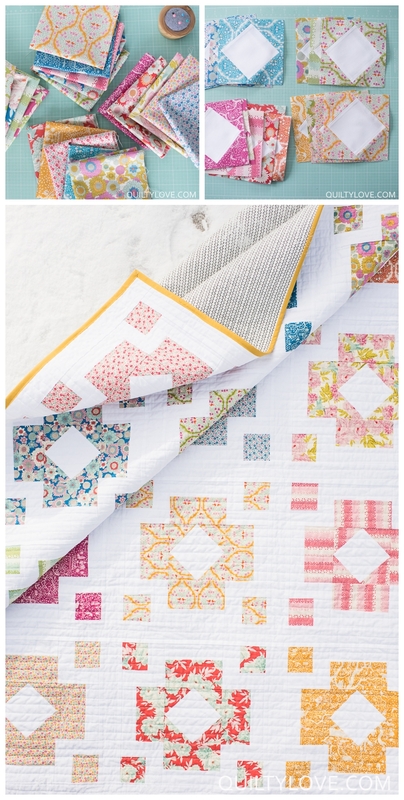 I wanted a quilt to show off each design beautifully. I’m kind of smitten with the colors in this line and those dainty florals. 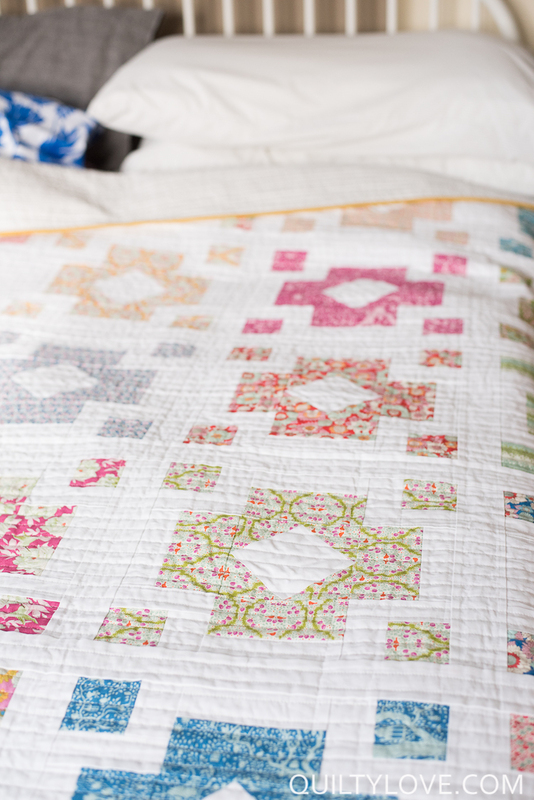 Diamond Lanterns quilt is a simple block quilt that uses fat eighths or fat quarters. 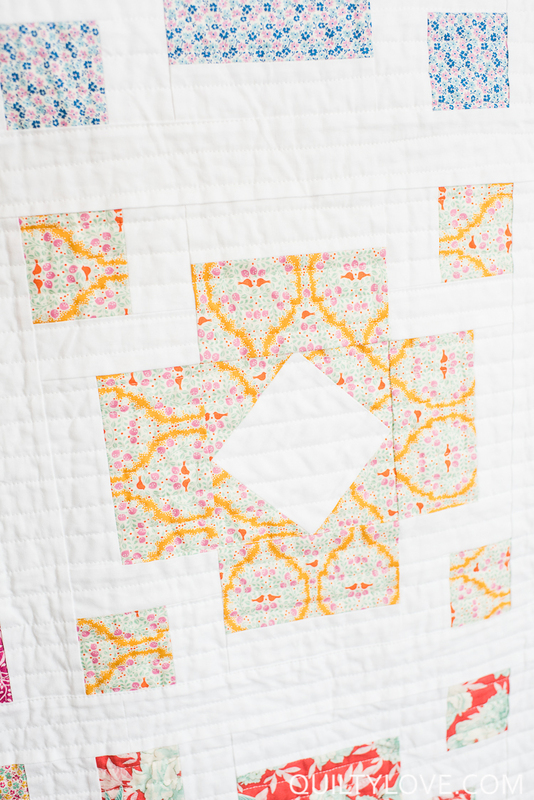 This quilt pattern comes in baby size, throw size, twin size and queen size. 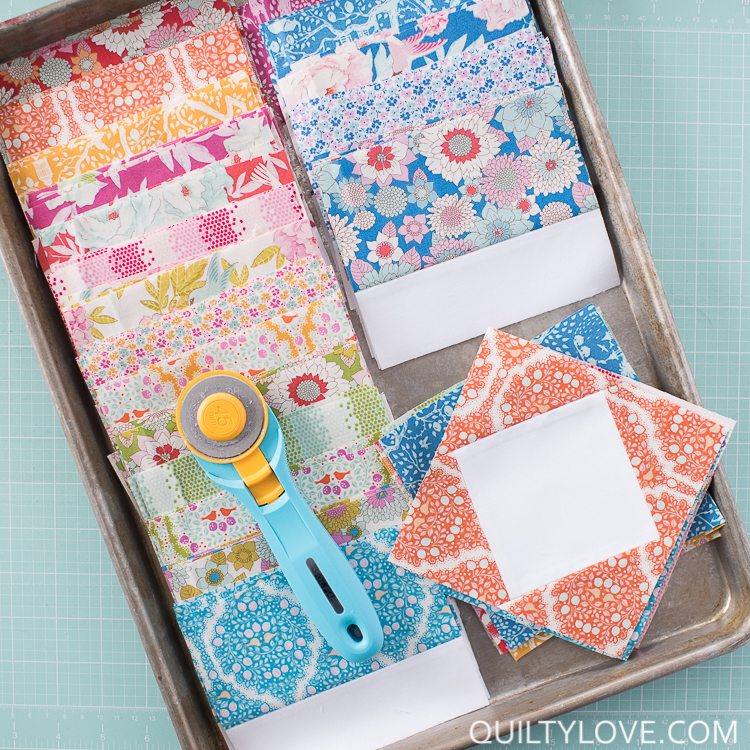 Use your favorite fabrics for this one or dig through the scrap stash. 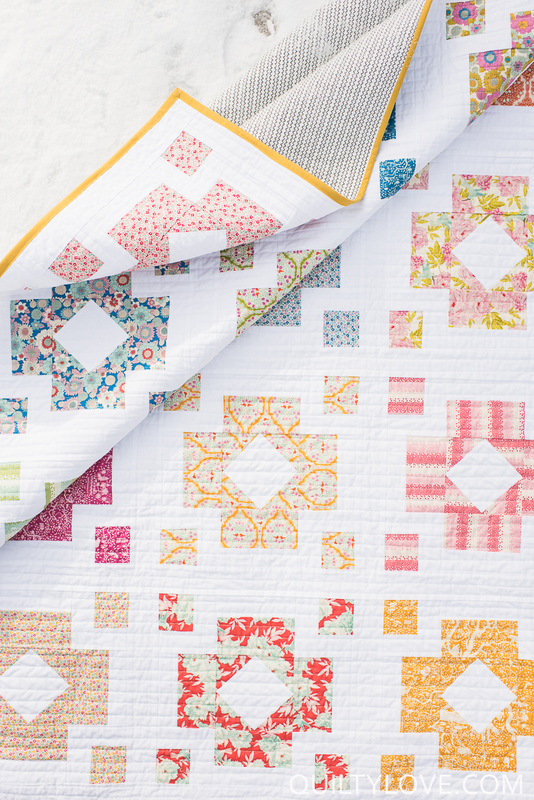 A lot of white space in this quilt really allows the fabrics to be front and center. 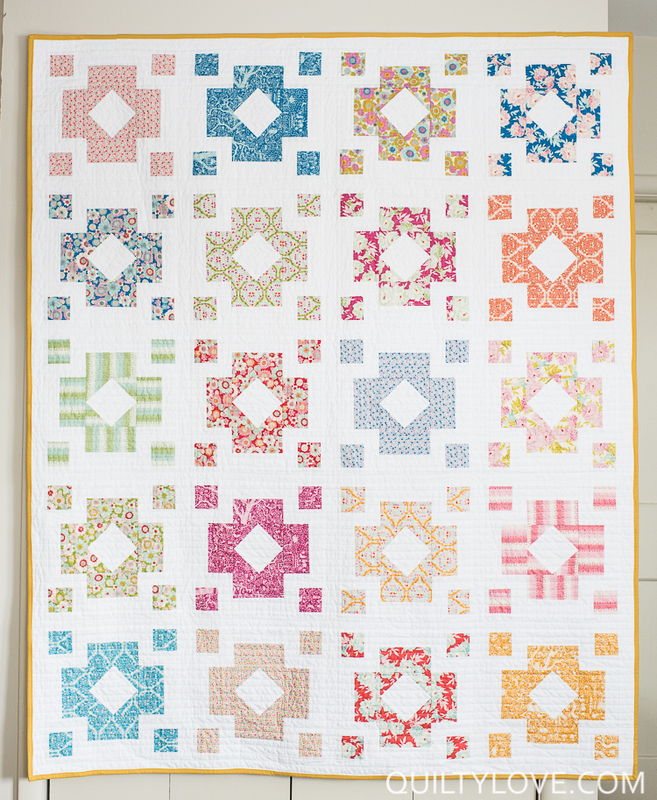 Diamond Lanterns is straight line quilted using a walking foot. The lines are spaced 3/4in apart. 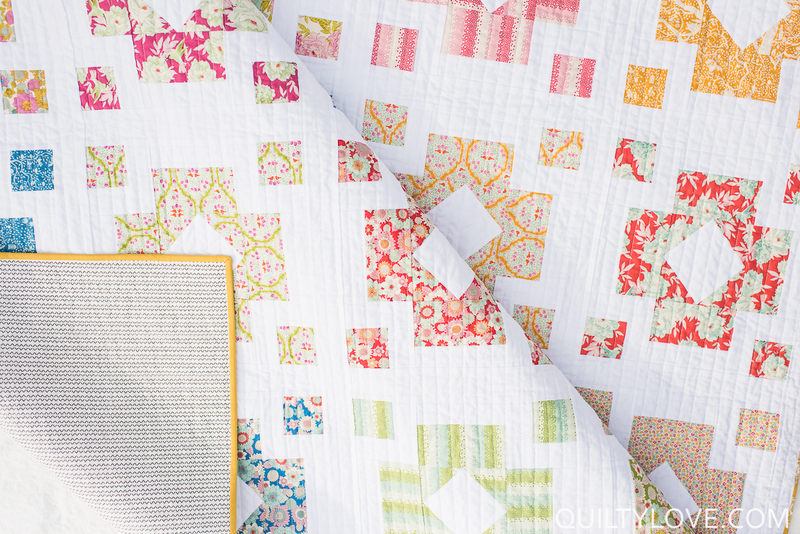 This quilt is pieced and quilted on a Janome MC6700P. 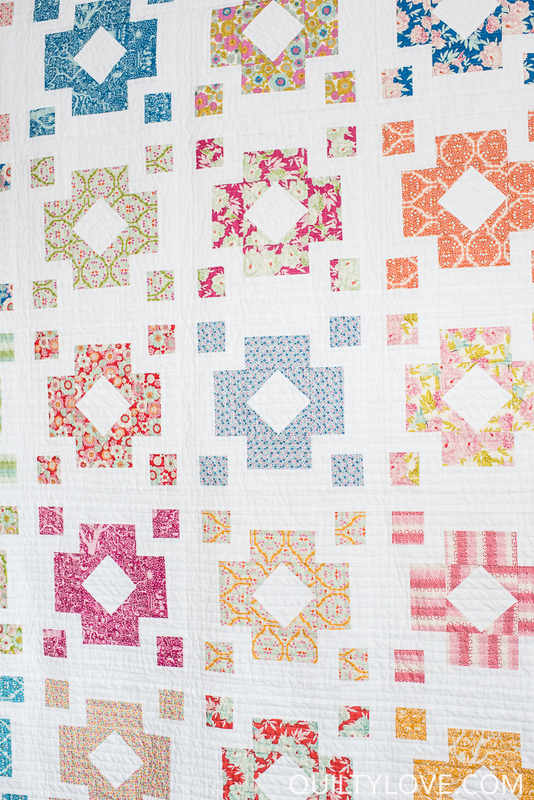 This quilt was basted 3 times…haha. I tried using a polyester sheet as a backing that was way too slippery. 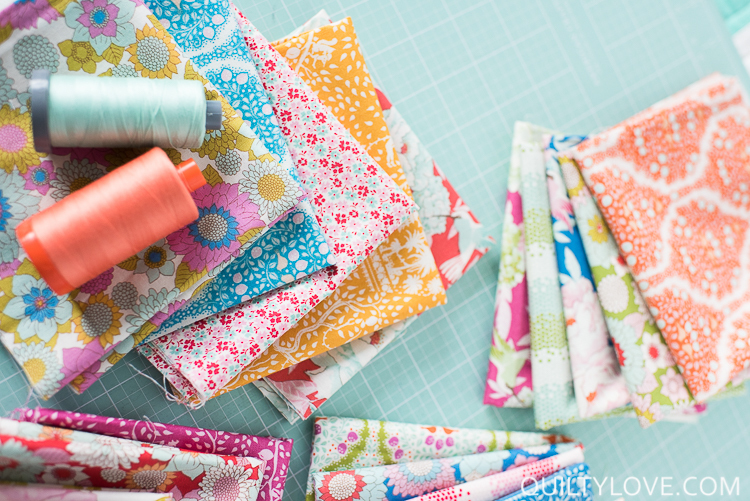 Don’t be tempted by the fun patterns of polyester sheets! Stick with cotton sheets! I did end up using another polyester sheet as the backing that wasn’t slippery. It worked out fine but I forgot how much softer cotton sheets can be. I love using sheets as quilt backs but will stick with cotton from now on. 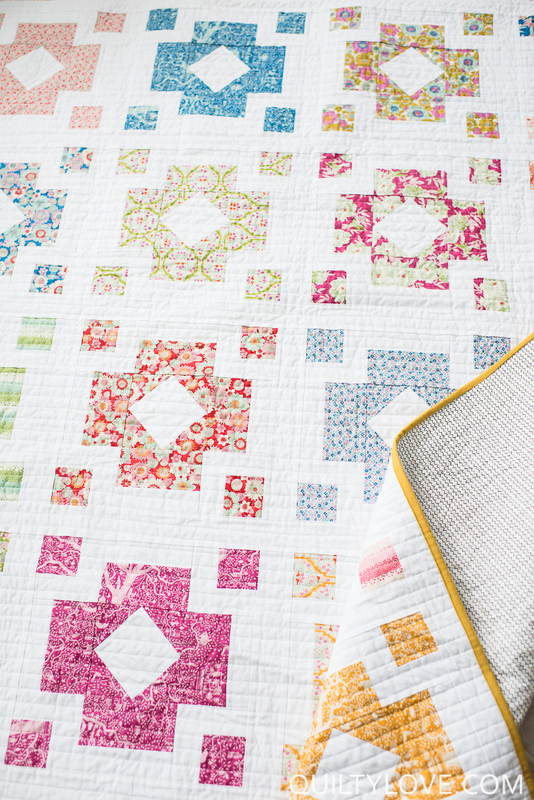 This quilt is bound using Kona Cotton in the color curry. 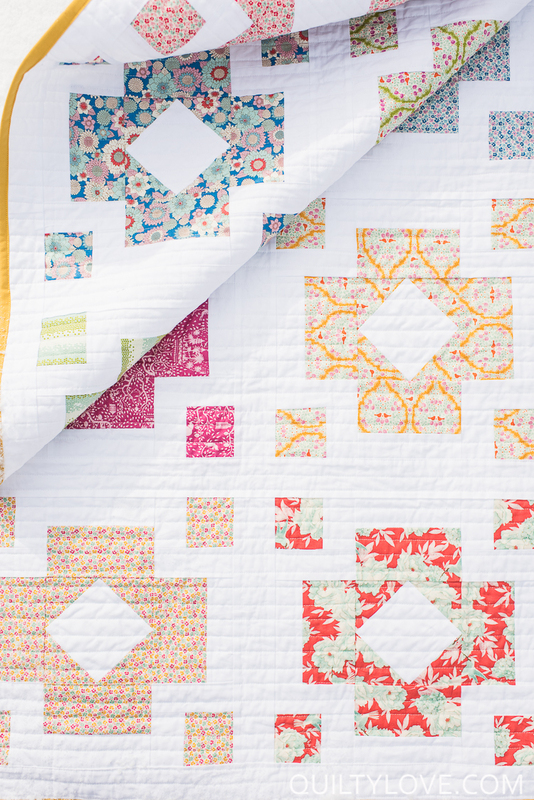 I love the pop of color it provides for this simple quilt. 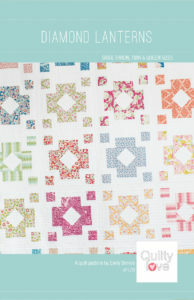 Grab a copy of Diamond Lanterns in the Quilty Love shop.